Nass&Wind Industrie and Ifremer are collaborating in the ROTOR project, an innovative model to test offshore floating wind concepts during tank test campaigns. Following the fixed offshore wind deployment in France, the French floating offshore wind industry is growing and technological developments are increasing. France’s objectives are among the most ambitious: to develop strong floating wind actors for the French market with the capacity to lead the international market. Floating wind is a key technology for the French marine energy development plan. According to the French Renewable Energy Association (SER - Syndicat des Energies Renouvelables), six Gigawatts of floating wind capacities are expected by 2030. To reach this target, a first call for tender has been launched by the French Environment and Energy Management Agency (ADEME - Agence de l’Environnement et de la Maîtrise de l’Energie) for pilot floating wind farms: 4 consortiums have been selected on the 3rd of November 2016. 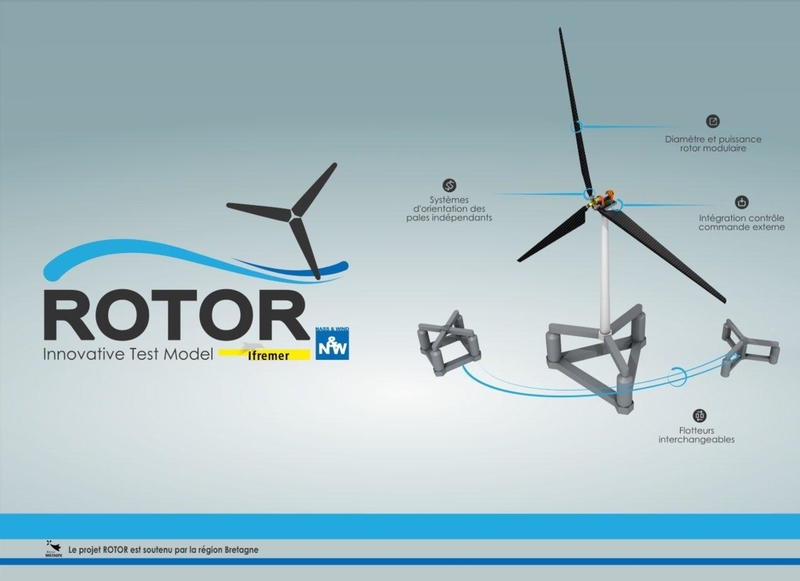 Rotor Project capture: Innovative test model for bassin test model of offshore floating wind concepts. “The ROTOR Project, supported by the Brittany region, is a step further for the collaboration between Nass&Wind Industrie and Ifremer, which has started in 2008 in the floating wind field. Our skills are complementary for this strong partnership”, says Dominique Le Roux, co-project manager and engineer at the Marine Structures Behavior laboratory of Ifremer center in Brittany, located in Brest. Nass&Wind is bringing its well-known expertise in the field of wind turbine, naval architecture and control command system. Ifremer is a specialist for tank test campaigns, hydrodynamic and aerodynamic assessments, mechanical and electronic engineering as well as instrumentation. By the end of 2017, Nass&Wind Industrie and Ifremer will have at their disposal a tank test model able to test, optimize and certify any offshore floating wind concept with HAWT (Horizontal Axis Wind Turbine). This model, developed with strong methodologies and innovative technological enhancements, will have the capacity and modularity to test any kind of floater type and control command strategy for a wind turbine range between 6 to 10 Megawatts. A full reduced scale model, with a rotor diameter around 3 meters, will be designed, built and tested during a tank test campaign at the Ifremer center in Brest in October 2017. This model will consist in a modular floater with a nacelle equipped to test power and speed regulation by integrating control command strategy from the wind turbine manufacturers. Each blade will be designed with an individual pitch control system. “Complex coupled behaviors between structure and wind turbine combined with wind and wave impact will be tested at a small scale and will allow us to validate control command strategies”, emphasizes Cyril Bourgoin, project manager for Nass&Wind Industrie. This model will be equipped with a full set of sensors. Data acquisition will give tremendous information for numerical models which are used in designing and optimizing full scaled offshore floating wind concept. Nass&Wind Industrie is a subsidiary of Nass&Wind, a French independent group specialized in developing renewable energy projects. Based in Lorient, France (Morbihan state 56), Nass&Wind Industrie is a team of experienced engineers mainly focused on providing engineering services and project owner support services for floating offshore wind farm projects. Nass&Wind has provided engineering studies in the offshore wind sector since 2008. With our strong track record, we provide services to all main actors of the offshore wind sector: turbine manufacturers, shipyards, utilities. 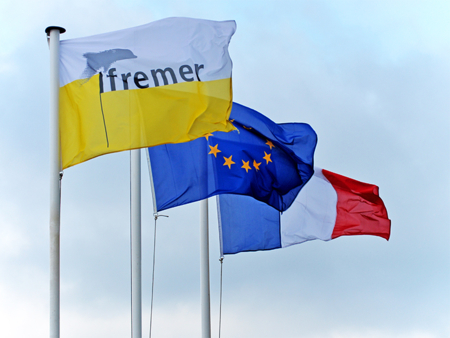 Founded in 1984, Ifremer is a French institute for integrated marine science research. Ifremer is placed under joint supervision of the Ministry of National Education, Higher Education and Research and the Ministry of Environment, Energy and Sea. Ifremer relies on its observation and surveillance capacities to produce scientific knowledge and know-how with economic value, in response to societal problems. Through systemic approach, Ifremer contributes to observation of marine environment at all scales as well as facilitating the understanding of ecosystems, processes that govern them and the services they offer, in a context of global change. 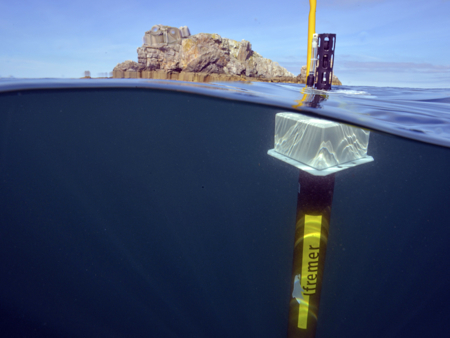 To this end, Ifremer designs and implements research and monitoring infrastructures for marine environment. It operates as well an important part of the French oceanographic fleet for the benefit of the entire scientific community. wwz.ifremer.fr.